The madrone tree (Arbutus menziesii) is a treasured beauty of the Sierra Foothills. It has a long history of use among the Native American, for both medicine and food, and has recently gained more attention here in the Sierra Foothills as a unique form of placed-based jewelry, often made into necklaces, malas and earrings. This year seems to be a record year for madrone berries – these bright red beauties are hanging in striking contrast to the deep green leaves in the tall reaches of these majestic trees. It could be due the drought – madrone trees need more water than oaks or pines – so its a good year to go harvest. Combine all ingredients, except for persimmons, in a saucepan and simmer for about 40 minutes, or until it starts to soften and there is still some liquid visible. Add the persimmons and simmer for another 5 -10 minutes, until desired consistency is achieved. This recipe makes about 4 cups. Pitifully simple, but worth pointing out how great these berries blend with roasted nuts. I soaked and roasted some fresh local walnuts and mixed them with partially dried madrone berries and YUM! Its a delicious way to fold some wild and native antioxidants and flavor into a simple snack. 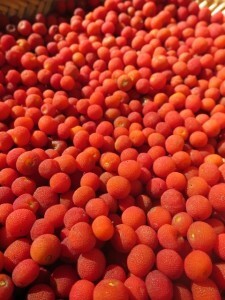 Why partially dried berries? I’ve found that the berries get sweeter as they dry – I think there are the best after a week or two of sitting out in basket – before they get completely dried out and rock hard (after several weeks of laying out). Like any berries, you could mix them with your oatmeal, through them in muffins, or just eat them with abandon by the handful. 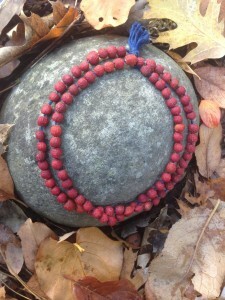 Another pitifully simple and fabulous way to use fresh madrone berries: use a needle and string them up into a necklace. Its good to use something thick and pleasant to look at, like embroidery thread, because as the “beads” dry they will shrink up and show the thread that connects them. A deep blue, orange or gold thread creates a nice contrast to the red berries. If you want to minimize the shrinkage, let the berries dry for at least two weeks or until they are shrunken but still soft enough to poke a needle through. Give your madrone jewelry enough time to dry before wrapping them up as a gift – they will also turn a deeper, more earthy red as they get dry and hard. The madrone is tricky to cultivate – and I consider it a symbol of the Sierra Foothill wildness that is not easily tamed! It is easy to identify by its thin, reddish brown bark that peels off to reveal a fresh green underlayer; leathery dark green leaves; and in the fall, bright orange and red berries that usually grow high above arms reach. You can find madrone growing in the Sierra Foothills below 5000′ feet, and if your lucky, you might encounter them growing majestic groves, almost entirely by themselves. If you are going to collect the berries, look for trees with low branches, bring a ladder, or a long handled pruners, or collect after a storm when the bundles of berries are often dropped on the forest floor. The sweetest berries are those that are the brightest red and have been through a seasonal frost (or have spent the night in your freezer!). Collect where you have permission, away from the roadside, and be sure to leave your gratitude for this amazing tree. Its really hard to over harvest the madrone berries – these trees are so tall, there will be plenty of berries left for the birds and other creatures. Again, madrone berries are so easy going as a foraged food – you don’t have to rush to process them, you don’t have to refrigerate them, and you don’t have to extract tannins or seeds – you can just put them in a brown bag or basket and let them sit up to 2 weeks or so (as long as you don’t put them near a heat source). If you wait too long, they will become rock hard, dried berries… which is fine, if you want to grind them into a sweet powder or simmer them in water to make a “cider” like beverage. If you want to use them fresh, invite over a good friend, serve up some tea, and start plucking those berries off the stem. The darkest berries will be the sweetest (and probably packed with the most antioxidants), and the orange ones will be tart (you might want to put those aside for jewelry). You will be left with a beautiful collection of red beauties, which you can now eat by the handful or fold into some scrumptious dish you are now inspired to make. The Chutney sounds delicious and I don’t usually like chutney! How long does it last in the fridge? And have you canned it before? I want to serve this at Thanksgiving. 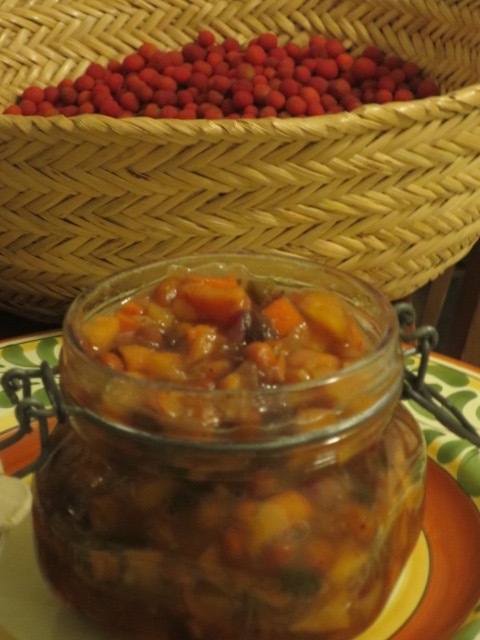 I’ve already been recently using the berries and bark, both in soups and stews and the bark tea is a regular thing now. I live just south of Portland Oregon and we have lots of Madrones here….including in my back yard! 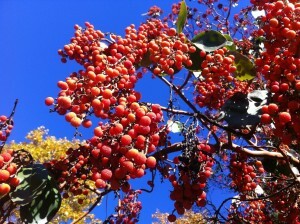 But I just learned last week that the bark and berries are edible! The rest of the garden has our native oaks but we also have many fruit trees and large raised beds. Everything we do is organically raised/grown. I’m still able to collect the Madrone bark this time of year as some of it has stayed attached and also it fell onto a wood pile. 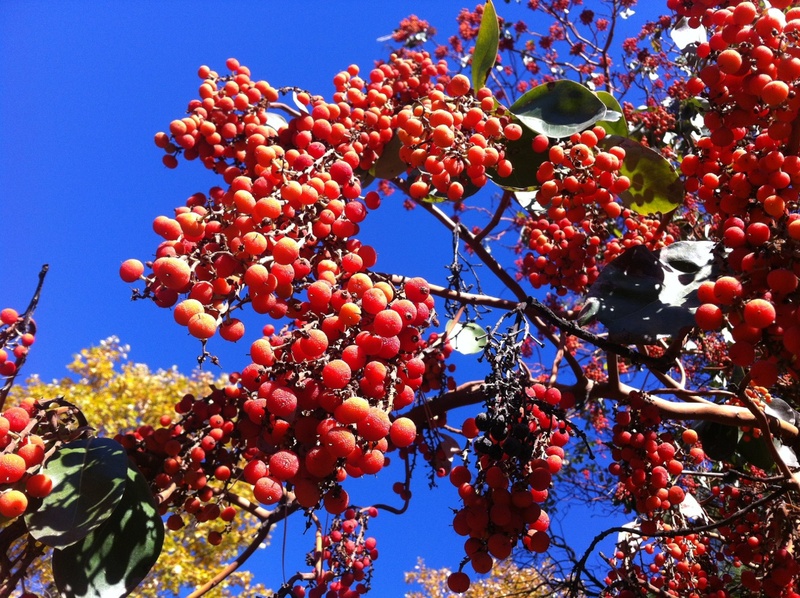 So happy to hear you have discovered the madrone berries in your backyard! I have not canned it before, but it lasts for at least a few weeks so you can make it early.